Get the look of subway tile without the grout! Go grout free! If you need a bathroom remodeler in Orlando, FL, you've found the right place. We're Re-Bath, and we employ a team of certified craftsmen. Since we don't subcontract, only our highly trained bathroom remodelers will perform the work on your home. Our goal is to make the renovation process as effortless as possible. With our help, it will be easy to get the bathroom you love. We generally complete projects within three to five days. While your work will be completed fast, it will also be finished properly. We offer a lifetime warranty on our exclusive product line and provide aftercare support. We want your new bathroom to create a healthier environment for your house. Your project will start when you reach out to us. The first meeting will be with a design consultant who can help you make smart decisions. We'll help you work out a plan that meets your expectations and stays within your financial resources. After we provide you with an estimate, you'll know the cost from start to finish. We don't change the prices on our quotes unless there's structural damage. This is one reason why we have very high ratings with both the Better Business Bureau and Consumer Affairs. We offer a wide variety of materials from acrylic to stone. This variety of options will allow us to find a design that can transform your bathroom without emptying your wallet. 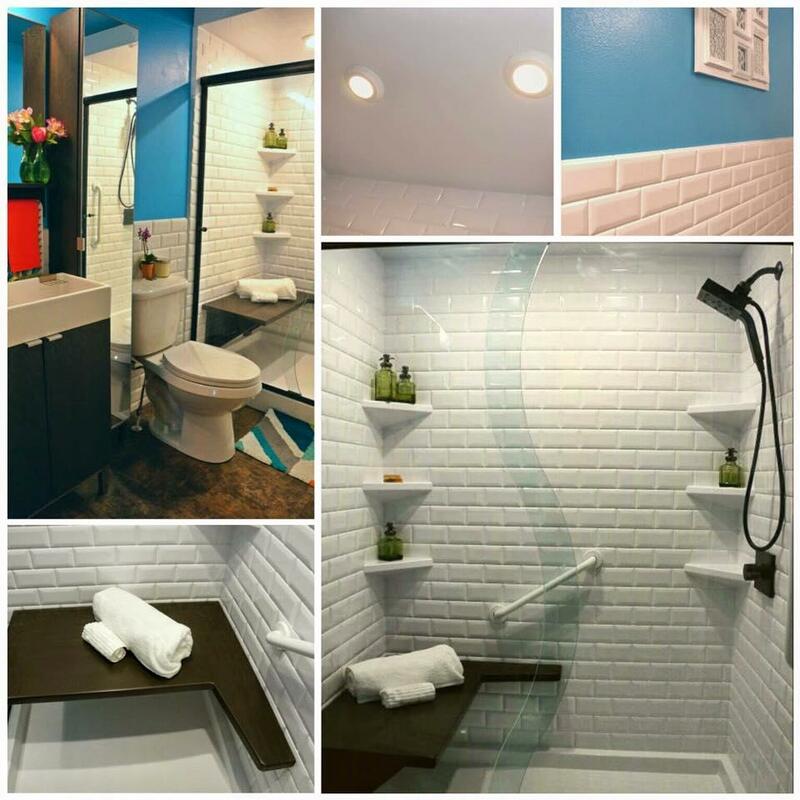 Our team is also familiar with ADA standards for bathrooms and qualified to offer aging and accessibility solutions. When you're ready to meet with a bathroom remodeler who serves the Greater Orlando region, give us a call. Your initial meeting with us will be completely free of charge. Our craftsmen are ready to help you transform your bathroom, and you'll be amazed how Re-Bath makes the difference. If there are financial concerns, know that we have multiple financing options available. Small Bathroom Tip#3: Custom shower glass panels allow natural light to flow through a small space. Our natural stone can be built easily around windows. We do it all!!! Accessibility options include walk-in safety tubs and walk-in showers with a bench. We are all employees and do not subcontract. We take everything down to the studs, to remove and replace your shower and/or tub. Pool bathroom with plenty of storage. Moen sink faucet in brushed nickel. Moen sink faucet in oil rubbed bronze. Moen sink faucet in chrome. Modern Moen sink faucet in chrome. Moen shower head with sliding handheld in chrome. Moen shower head with handheld in chrome. Large walk-in stone shower with custom glass and Bertch vanity. Before and After...a vertical cabinet from Bertch adds more space! Natural Stone Shower in Ivory Vein Travertine with Custom Bench, Niche, Rain Head and Handheld. Custom Solid Surface Shower in Tahoe Granite with Complimentary Vanity, Mirrors and Lighting. Small Bathroom Tip #1: A vanity using verticle space adds more space! Small Bathroom Tip #2: Use the space on the back of your bathroom door to hang towels. Small Bathroom Tip #4: Creating verticle storage for towels saves space! Small Bathroom Tip #5: Consider removing an old garden tub and replacing it with a walk-in shower. Small Bathroom Tip #6: Custom niches built-in to your shower make best use of your space! Small Bathroom Tip #8: A fold down bench is there when you need it and folds away when you don't! Small Bathroom Tip #9: Bright, larger tile floors make small spaces more airy! Small Bathroom Tip #10: Unique storage solutions for even the tightest of spaces! Travertine Stone Shower with decorative grab bars and folding teak bench by Moen.